I have been thinking a lot about what will be my next lace project and for who. There was a yarn at my favourite yarn store in Hafnarfjörður was always catching Gummi's attention but not mine really, I wasn't really sure about the color. 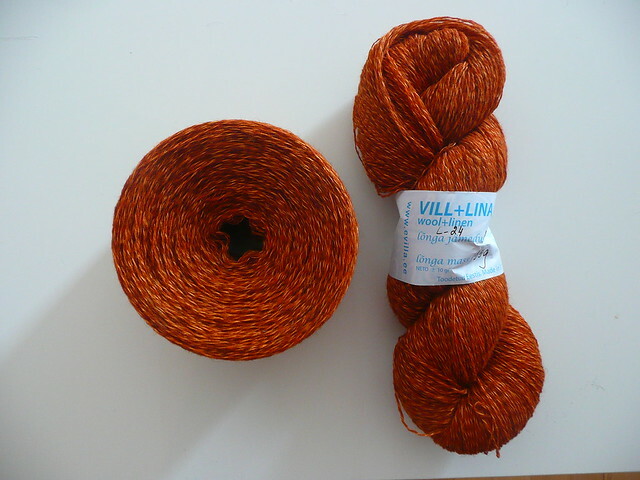 It is a blend of linen and wool from Evilla. Finally, I decided to buy one skein for Gummi so he could try it. The funny thing is that after looking at it for a while I started to like it a lot also! 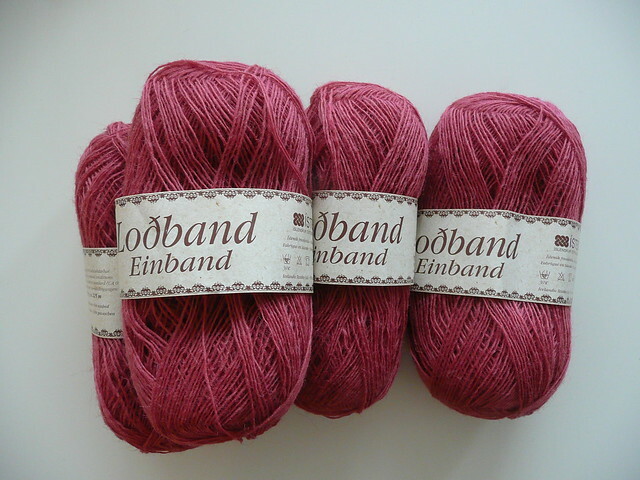 Besides I have been looking for a yarn with a solid color (not color changing) and unfortunetely most of the yarn from Evilla is not solid except for a couple of skeins... so I ended up buying three skeins (all of it actually... they were the last ones in this color). Then, I had the yarn but I was still missing two things: what to knit and for who. 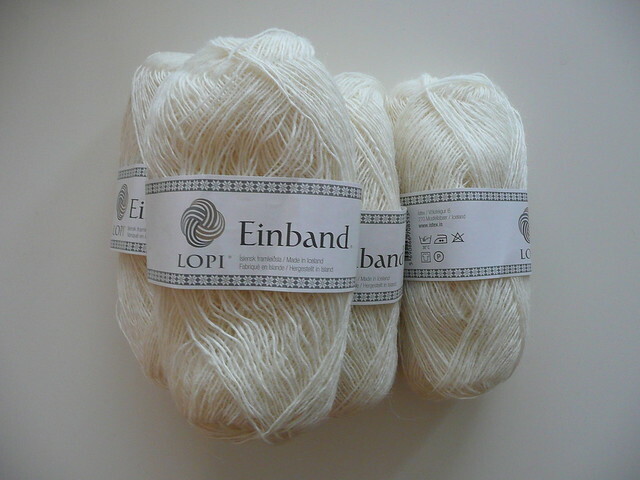 I suddenly came up with the idea of knitting a shawl for Irene, to whom I had already given a lopapeysa. She will get married in September and I thought that this would be the perfect gift for her and she could maybe even wear it during the ceremony. So, I told her about my idea and she got SO EXCITED about it! Especially because she was thinking about getting something to cover her shoulders and back during the church ceremony and had no clue about what to use! I guess that my idea came just at the right moment for her! The orange yarn woud probably be too bright for an occasion like this. I decided then to invite her to come with me to the yarn store (We actually went to a supermarket called Fjarðarkaup that has a very good "knitting section") and see what we could find there. 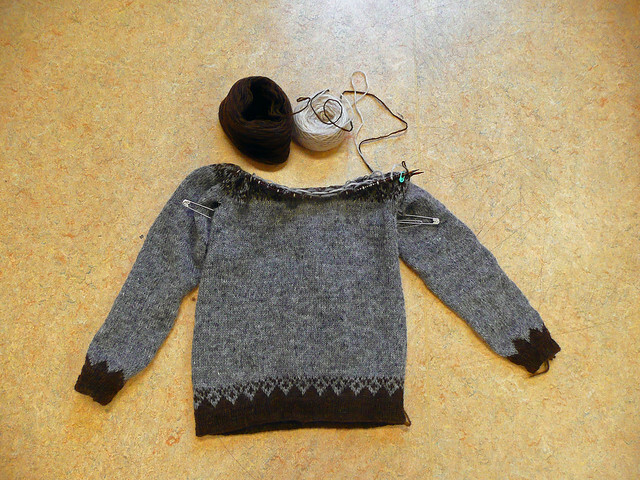 In the end, we decided to use Loðband, icelandic lace wight yarn, both because it is icelandic and it i very light and can be warm to wear during winter. The color, she went for a classical white. Next step: Pattern. We went through some of the books I have and her eye was cought almost immediately by Estonian lace. We took a look at The Haapsalu Shawl. She marked about ten patterns that she liked to finally decide for a very simple pattern: just leafs and no nupps. It will be a long rectangle with a sewn on edge all around and with nupps. I am now planning to finish my Vetur that is going really well even though I didn'tn manage to finish it during the weekend (busy, busy weekend). But I already began the yoke: FINALLY! It is looking pretty good and definetely bigger than the first one. I hope to finish it tonight and start with Irene's shawl! And the last thing for today... On friday I got really excited bacause when I got home around six I found in the mailbox a notification from the post office saying that there was a package for me! Finally! After three and a half weeks the box that my sister sent me from Chile had arrived! I went to the post office as quickly as I could. I got there at 18.03 and it was closed! (at 18.00)To my disappointment I had to wait until monday to go get the box. 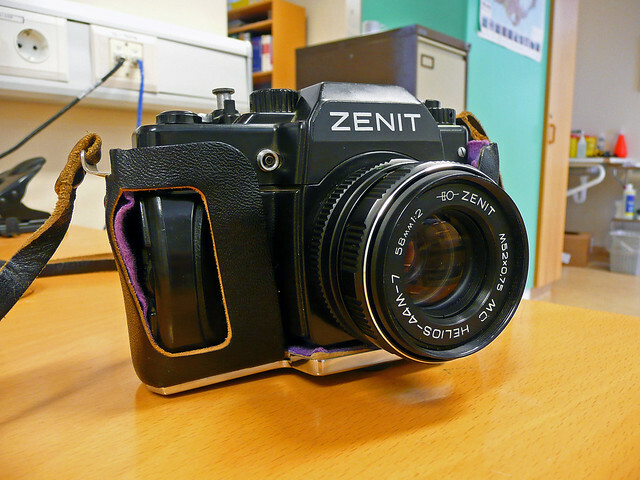 I got my old Zenit camera! (along with merquén and roasted peanuts) I had totally forgotten that I had this camera until I saw Genieviève and Kristina use theirs! I hope that mine is still working! Mér finnst svona laufamynstur svo ótrúlega fallegt! :-) Ég er spennt að sjá hvernig sjalið þróast hjá þér! Mér finnst öll munstrin úr nátturunni (eins og laufum, blómum, hrömmum, o.s.frv.) vera svakalega falleg! Ertu byrjuð að prjóna sjalið? Yo conozco ese color como "palo de rosa" (y es uno de mis favoritos!) 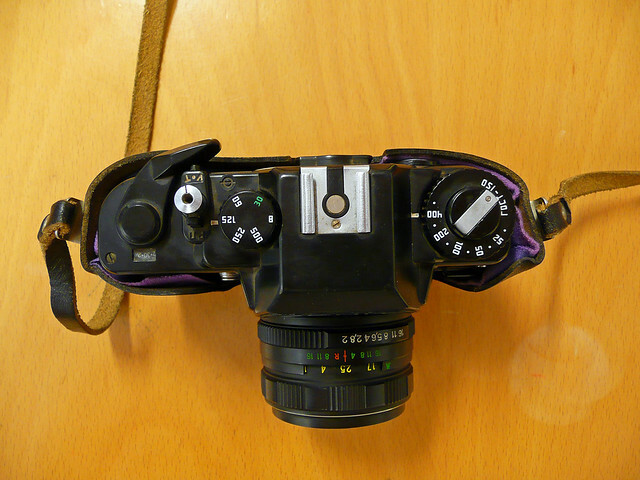 pero no tengo idea de cómo se llama en inglés... Un amigo tiene como 2 cámaras zenit (u otra rusa no recuerdo) y están bien bonitas, después de usar puras digitales tiene un encanto especial usar cámaras "vintage", saludos! veo que te gusta mucho el "lace"
Alex: Lo más popular aquí es Lopi y todas su variedades. En realidad es lo único que es REALMENTE barato. La alpaca me encanta! Para tejer encaje es FABULOSA!. También tienes una cámara analógica? Sæll! Ohhh hvað ég er sammála þér - öll náttúrutengd mynstur (og reyndar litir líka) finnast mér falleg! En nei, ég er ekki byrjuð að prjóna - en ég er búin að lesa uppskriftina mörgum sinnum og aðrar á íslensku til að reyna að skilja hvað það er sem ég á að gera (þetta er kvöldlestningin mín :-) . Byrja svo að prjóna í lok þessa mánaðar/byrjun næsta mánaðar þegar "hjálpum Japan-átakið" er búið... En góða skemmtun við að byrja á sjalinu þínu! I can't say that the color of the Evilla yarn would be my choice, but I will be waiting to see what lovely you will make with it. Now the shawl for Irene....that is going to be beautiful and what a special friend you are to make such a special gift! I do like the rose color yarn. Any shade in the pink family is my favorite. :-) You know, if you really have a hard time finding someone to knit something for, I am always willing to receive any of your creations! :-) Both of my parents were professional photographers, travelling all over the world taking pictures, and I do believe they had every camera in the book. Seems my dad always went back to the tried and true, though. Hope your camera still takes great pictures. About pink, something really has been happening to me. I have never liked pink so much but lately I have found myself ALWAYS looking at the "pink section"! I really liked the one I bought. Do you know the name of this color? Béa&Scarlett: Merci beaucoup! Je veux commencer à tricoter le châle le plus tôt possible. Je suis très heureux avec mon appareil photo!! mm j'ai un appareil photo , sony AX200, un proffesionnel, mais là ..
il ne marche pas trop bien et ça me manque ..
J'ai appris un peu de français au lycée il y a loooongtemps! ce n'est pas compliqué .. tu verras ! !